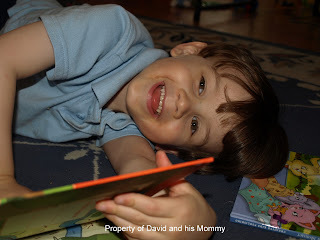 Literary Lindsey: Wednesdays with David: Who Is Coming To Our House? Wednesdays with David: Who Is Coming To Our House? The story: The little mouse who lives in the barn tells his companions that someone is coming. They begin to clean their home and prepare for their visitors. But no one knows who will be arriving! The animals are pleased to discover that Mary and Joseph arrive at their door. They won't have just two guests for long! Mama opines: Alright, I did it. I pulled out a Christmas book and November just started. But in my defense, it is snowing here. Yes, you read that correctly. Last week, Hurricane Sandy and this week, we are "enjoying" a snow storm. I love this book. It's very sweet and just repetitive enough to help young readers without driving Mom or Dad crazy. I'm probably biased because this was my book as a little girl from someone very special to me, but it remains one of my favorite Christmas books to this day. Thoughts from David: Well, I like it because it has a lot of animals and they ask who is coming to their house and they wondered who it was. Favorite part: When the little little chick was sweeping the floor. When do you break out the holiday books? Labels: Wednesdays with David, Who Is Coming To Our House?